Solange has the virtual travel bug. Once she realised it’s possible to travel, work and/or go to school at the same time, she had the notebook out, compiling a list of all the places she wants to visit. She and the kids decided they’d really like to see snow for the first time and are in the Swiss Alps (we hope). Leroy and I, on the other hand, have crossed the southern border of BiH into the tiny republic of Montenegro (‘black mountain’). 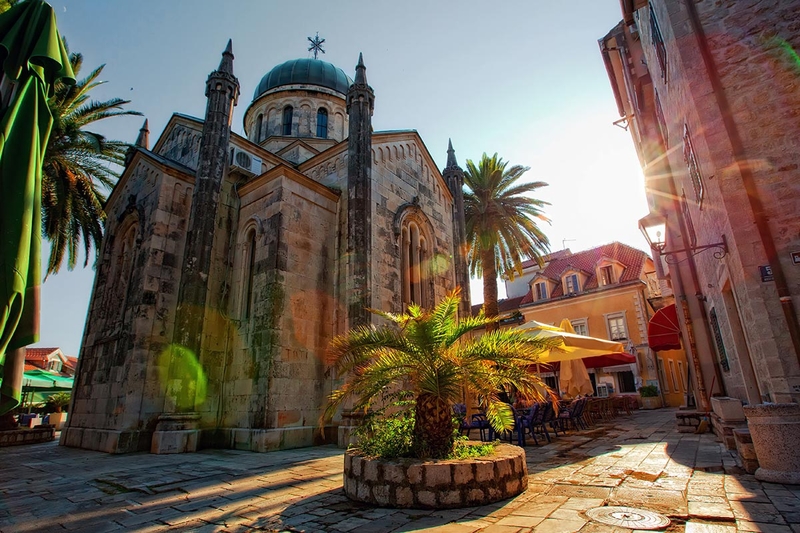 Take a slice of Adriatic coastline, add some lowlands and craggy mountain ranges, then throw in a sprinkling of Roman villas, Orthodox monasteries, Catholic churches, mosques and fortresses. Now add a dash of non-aligned communism and serve piping hot. It’s a fascinating place. This morning, after an early breakfast of cornmeal porridge (fortifying, if nothing else), we chartered a boat with a Spanish family to the a huge sea cave on the Bay of Kotor. It was so beautiful inside, the reflections of the crystal-clear blue, blue water flickering over the cave walls. We had a 30-second swim – the water was freezing – then set off for the mountains in the hope of seeing wolves, or at least a view. We began hiking up the terrifyingly steep and narrow road to the famed (Orthodox) Ostrog Monastery, but gave up when a car nearly ran us off the edge and travelled the rest of the way virtually. Built into the side of a cliff 900m above the Zeta valley, it’s not really obvious how it’s staying up. Even in November, a quiet month for tourists, there were plenty of people around – both pilgrims and visitors. We’re going to give the wolves another hour to show themselves, then we’re heading to the medieval city of Kotor, with its fortified walls and Venetian palaces and pillories. And the cats. Apparently there are hundreds of felines – the descendants of centuries of seafaring cats – lounging around the alleys and plazas. There’s even a Cats Museum, although I’m pretty certain we’ll run out of time to see that (fingers crossed).